The only wide-angle that goes to f/1.8, an entire stop faster than its competitors, this super-fast lens for Canon and Nikon full frame DSLRs, and Sony E-mount mirrorless cameras, enables incredible compositions. This is a lens that's all about speed. I've been photographing the night sky for the last few years, and I've got used to the settings on the manual focus Samyang 14mm f2.8 ED AS IF UMC Lens f2.8 for 25 seconds. Easy. In the dead of night, I only ever tinker with the ISO. Stepping-up from that £300 lens to this £1,200 lens for astrophotographer, however, doesn't just change the settings. It changes everything! Available with mounts for full-frame DSLR cameras from Canon, Nikon, Sigma and Sony (E-mount), the Sigma 14mm f/1.8 is all about speed. The widest aperture 14mm lens in existence, it adds a whole extra f-stop, going down to f/1.8. That has the instant effect of being able to do in about 10 seconds – and often far less – what normally takes 25-30 seconds. In short, it finds the Milky Way a lot quicker, and even puts it on the camera’s LCD screen. 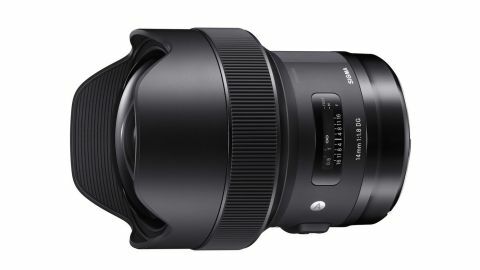 Although astrophotographers are likely going to use the Sigma 14mm f/1.8 on manual infinity focus, this is an auto-focus lens, and it’s almost completely silent. Whether you're planning moody images of landscapes covered in cloud (a particular skill of wide-angle lenses like this) or photos featuring bokeh (another highlight), the Sigma 14mm f/1.8 is more versatile than it initially seems. For all its talents, the Sigma Art 14mm is not particularly easy to travel with. For starters, it weighs 1.12kg, over twice as much as a 500g Samyang 14mm f/2.8 I'm used to traveling with. But the real issue is its unavoidable fisheye-shaped lens, which here has a 114° field of view. Forgetting adding a UV filter to protect this lens. That's a problem astrophotographers are used to with all wide-angle lenses, but on the Sigma Art 14mm its glass really is very bulbous and, frankly, it costs a lot more than most lenses used for astrophotography. It sticks out so much that I was permanently afraid of scratching it. However, I made it through a long trip through Namibia with only a little dust to remove – and zero scratches – so this isn't a warning, just something to bear in mind. The optical design is based on 16 elements, laid out in 11 groups, while the Sigma 14mm f/1.8 also builds-in a 46-megapixel APS-C X3 direct image sensor. The entire lens has a dust- and splash-proof design. Use the Sigma 14mm f/1.8 for astrophotography and concerns about which ISO setting to use pretty much become a thing of the past. Instead of trying to maximise the amount of light coming into a f/2.8 lens by braving higher and higher ISO settings (and thus battling noise in post-editing), having access to the f/1.8 chops of the Sigma 14mm means ISO can be left on a conservative setting. Used on the Milky Way at f/1.8 for 10-25 seconds at ISO 3200-4000, the results on a full-frame Canon EOS 6D were impressive. Put simply, collecting more light gives you a lot more options. For example, a 25-second shot on a f/2.8 lens gets the Milky Way looking bright, but only after it's been teased-out on Photoshop. Using the Sigma Art 14mm, the Milky Way is right there in the LCD on the back of the camera, especially if the exposure time is 20 seconds or more. You can frame a shot more easily while out in the field, but the real benefit is a clean image. Since the shutter is open for less time to capture the same amount of light, it means using a lower ISO. A shorter exposure and a lower ISO means less noise. Shorter exposures also means sharper stars with less trail. It's win-win. In fact, you can add another win, because its f/1.8 setting also means a shallow depth of field, so when used in daylight it's easy to create shots featuring a clean and seamless bokeh effect. Add to that some fine detail, excellent contrasty colours, and a near-silent auto-focus, and it’s quite a package. However, the Sigma 14mm f/1.8 is not perfect. It chronically weighs down you camera bag, which is galling if you only intend to use it occasionally at night. Although this lens gives excellent sharpness and detail in the centre of photos – where it's truly excellent – we did notice some distortion in the corners of our images. However, it's not nearly as afflicted as cheaper wide-angle lenses, so it's slightly unfair to complain. The Sigma records about twice as much light as any other astrophotography lens around, and as such it's so, so useful in creating more impactful night sky photos. In fact, it’s as much about taming this light bucket of a lens as it is about getting the most out of it, and generally the best results come from using shorter exposures times and a lower ISO, which means clean and sharp images of the night sky. Not that the Sigma Art 14mm doesn't bring some restrictions. The front element on the lens is super-curved, and since it's impossible to fit filters without a complicated filter holder set-up, it's likely that the Sigma Art 14mm will need to be used naked. Astrophotographers are used to using wide-angle lenses without filters on, but usually those lenses are a lot less valuable that the Sigma Art 14mm. It requires careful handling, and at 1.2kg it’s a heavyweight option. In an age where the slow-glass in smartphones dominates, this lens' fast-glass is something to get excited about. It's big, it's heavy and it's expensive, but if you're into astrophotography, the Sigma 14mm f/1.8 DG HSM Art lens is also unbeatable if you’re heading out into the night.